Apple‘s new service offerings will do little to draw new users the tech giant grapples with slowing iPhone sales, HSBC said. The warning was the latest in a series of cautious notes from the bank. 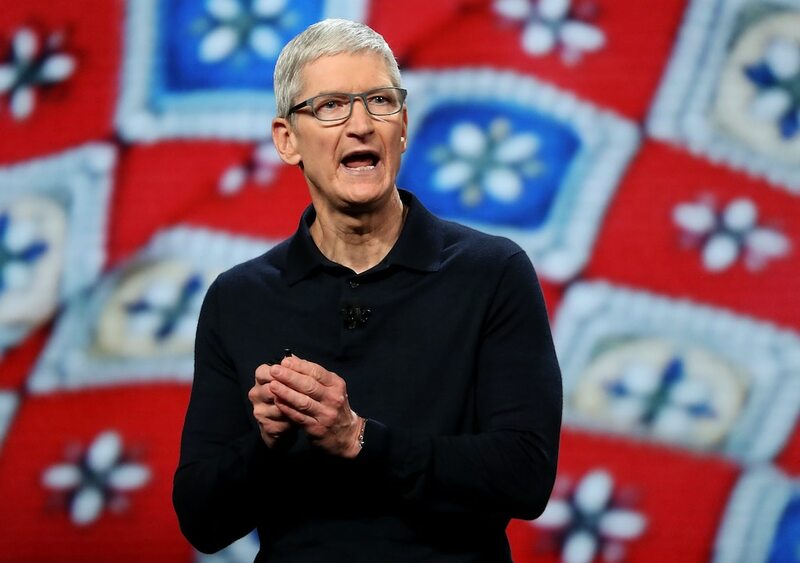 Apple‘s special event back in March was star-studded and filled with fresh service announcements, but the slate of new offerings like Apple Card and Apple News+ ultimately underwhelmed investors. HSBC analysts now say the services will do little to attract new users as Apple grapples with slowing iPhone sales in key markets. The London-based bank downgraded Apple from “hold” to “reduce” in its latest warning on the iPhone giant. Rambourg’s team began chopping down its expectations for the company back in December amid fears of a slowing iPhone cycle and weakening conditions in China. It issued similarly cautious notes January and February. “Services makes ecosystem more sticky but won’t necessarily enable Apple to recruit more consumers to iPhone, we feel,” the analysts said, adding the newly announced offerings all face stiff competition in their respective industries: banking, streaming, gaming, and news media. While some of the debate around Apple’s direction has hinged on whether the iPhone maker needs to bulk up its growing service business to offset slowing product sales, products are still the lifeblood of the company. 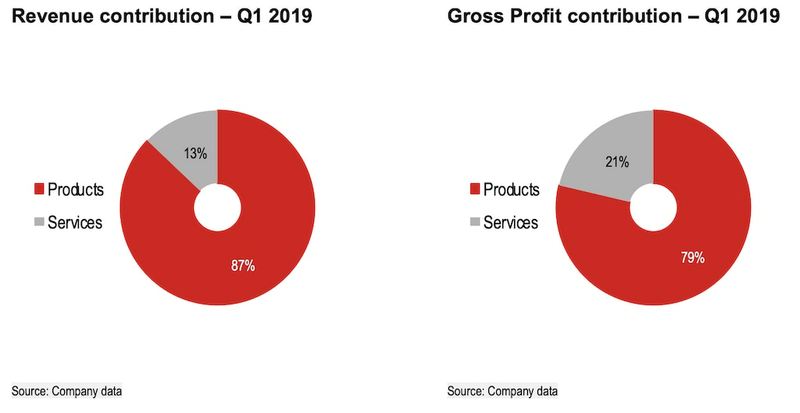 In the first quarter of this year, services contributed 13% of the company’s revenue and 21% of gross profits, HSBC estimated. 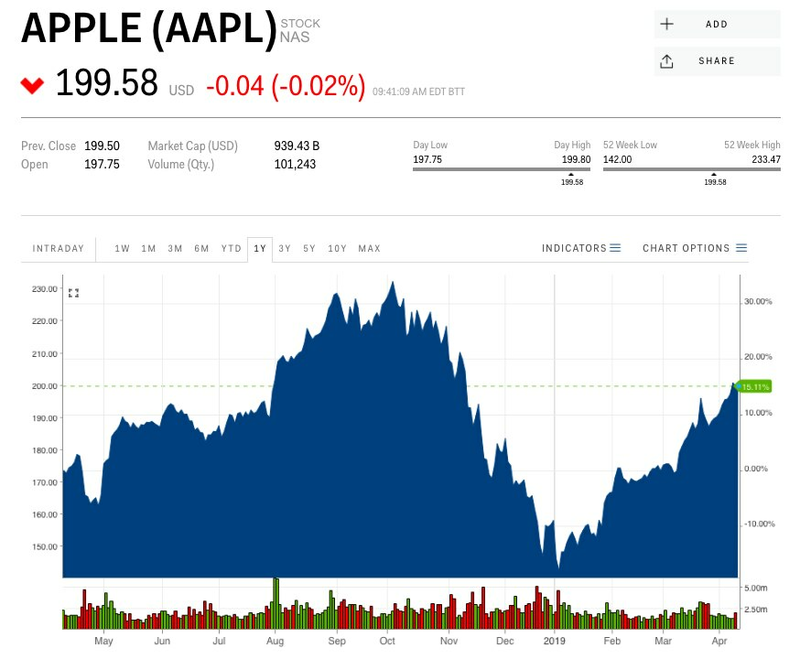 Apple’s troubles go back to the beginning of the year, when CEO Tim Cook warned shareholders the company’s holiday quarter was far weaker than previously expected. The announcement rattled investors, and shares plunged by as much as 10% the following day. Prior to its pre-announcement, Wall Street was already sounding the alarm on slowing iPhone sales as consumers begun replacing their phones at a slower clip and favoring cheaper competitors. Still, Apple shares have staged an impressive comeback, with shares up 26% so far this year. However, they are still trading about 14% below their all-time high of $233.47 set in October. Despite HSBC’s rating downgrade on Tuesday, the firm upped its price target from $160 to $180 a share, implying a drop of around 10% from current levels. Apple is set to report its first-quarter results on April 30.